2017 has seen some serious TV milestones. The legendary Game of Thrones reached its penultimate season, the first female Time Lord stepped aboard the TARDIS in Doctor Who and Twin Peaks reclaimed its title as the ultimate cult sensation. However, it’s time to reflect on the year as a whole. So without further ado, here are The Edge‘s TV picks from 2017. Orange is the New Black Season 5 aired in June this year. In traditional Netflix fashion, all 12 episodes were released on the same day. As it was all set over a three day period in Litchfield Penitentiary, it provided a perfect 12 hour marathon for those of us who love a good binge-watch. Season 5 was a satisfying change from what we’ve come to expect from the series as we got a lot more face-time with the some less familiar characters and the idea of donating so many episodes to such a small time-frame actually worked really well for the show. As always, the end of the season left us on a huge cliffhanger; the women are being shipped off to different prisons and the golden oldies are still missing. Anticipation for Season 6 is high and every OITNB fan is dying to see how the show will play out away from the walls of Litchfield Prison. David Lynch’s return to the town of Twin Peak was both wonderful and strange, but mostly strange. It saw Agent Dale Cooper (Kyle Maclachlan) and Laura Palmer (Sheryl Lee) reunited 25 years after the end of the original, ground-breaking series. Seeing the familiar faces, albeit older, and in the familiar town, was an experience many hadn’t dared hope for, but it was worth the wait. They are a joy to see again, especially the late Catherine E. Coulson and Miguel Ferrer as the prophetic Log Lady and FBI Agent Albert Rosenfield. The cast of new characters and the host of new settings, expanded the world of the original series, giving the show a much wider scope than the town of population 51,201. In traditional Twin Peaks fashion, the revival is full of period of nothingness and no sense of chronological narrative. Like the original, it subverts the norms of television by leaving questions unanswered and the supernatural unexplained. It is a radical Lynchian dream and the chance to experience it as it airs (or as close to it) is not an opportunity to miss. The Handmaid’s Tale was one of our favourite TV show of the year. It received excellent critics and won eight Primetime Emmy Awards including Outstanding Drama Series. Based on the 1985 dystopian novel by Margaret Atwood, Bruce Miller’s show explored the experience of Offred in a near future when human fertility rates have dramatically declined, creating a society based on women’s exploitation called Gilead. The dramatic performance of Elisabeth Moss as the main character guided us through this horrible world over 10 episodes. While all the characters were given a great deal of depth, the performance of all the cast adds to this emotional dimension and make it a small screen masterpiece. Exploiting the story in an entertaining way, it also gave the audience a lot to think about their society and how quickly things could go the way they do in The Handmaid’s Tale. If you have not yet watched this show, don’t be afraid of the chills and give it a try before the second season is broadcast in April. 16 years after the first Blue Planet, Sir David Attenborough returns to the deep blue with new, improved technology, and plenty of pleas for us to help save the planet we’re slowly destroying. Blue Planet II won ratings wars left and right while it aired, becoming the most watched programme of 2017, and was recently voted the best by TV critics for Radio Times. And it isn’t hard to see why. With creatures like a psychedelically luminescent starfish, a hypnotising cuttlefish, and scheming seals, the wonders didn’t stop throughout any of the seven episodes. Just as in Planet Earth, Hans Zimmer’s score makes the documentary a cinematic masterpiece, and the newly developed and sophisticated technology means that there are plenty of things being recorded for the first time. The mini making-of documentary at the end of each episode offers a fascinating look into the difficulties and triumphs of filming, and makes Blue Planet II a programme to admire, as well as enjoy. No show from the past year has hit as close to home nor stirred up as many real life issues as The Edge‘s number six pick. Based on Jay Asher’s novel of the same name, 13 Reasons Why tells the story of a high school living in the aftermath of the shocking suicide of student Hannah Baker (Katherine Langford). Soon enough a box of tapes begins to make its way around the students, Baker giving the 13 reasons why the recipients are to blame for her death. 13 Reasons Why deftly manipulates our emotional attachments and causes us to question everything we see and everyone we know. However, it also refused to stay within the confines of the screen and became the controversial show of 2017; the discussion of mental health, bullying and suicide was forcefully thrust into the spotlight once more. 13 Reasons Why suddenly became essential viewing. I could unpack every detail of 13 Reasons Why in so many more words, but I’ll leave it at this for now; it’s very much like marmite, but marmite has never been this important – 13 Reasons Why demands a place on this list. Possibly serving as Benedict Cumberbatch’s final outing as the famous detective, Sherlock Season 4 received a mixed reception when it aired back in January. However, that hasn’t stopped The Edge voting it as the 5th best piece of TV from 2017. Benedict Cumberbatch and Martin Freeman can’t be faulted for their acting, the dynamic between Holmes and Watson perfectly balancing the necessary the tropes of the genre and a certain unique flair that brings life to the characters. Although Mark Gatiss and Steven Moffat can certainly be faulted as writers, a simultaneous love of Arthur Conan Doyle’s work and their desire to create a new story for the 21st century means that Sherlock is never short on surprises. Series 4 is no different with the dramatic death of Mary Watson, the explosive return (?) of Moriarty and the shocking reveal of the psychopathic Eurus, it was certainly an intense year for Sherlock and Dr. Watson. It was a massive send-off for the detective and wrapped up many of the loose ends left over from Series 3. Whatever your opinion on Series 4, it is hard to deny that Cumberbatch and Freeman went out with a bang! Doctor Who Season 10 ended with an explosive Christmas special after spending 12 weeks reaching new heights and re-imaging old foes. The series introduced the brilliant Bill Potts (Pearl Mackie), a university canteen worker that the Doctor (Peter Capaldi) took upon himself to tutor. Series 10 also undertook the mammoth task of bringing back John Simm’s incarnation of the Master, a beloved character who made his last appearance in the 2009/10 special ‘The End of Time’. Hidden under layers of makeup as the mysterious Razor, his big reveal at the end of penultimate episode ‘World Enough and Time’ wasn’t as shocking as it was breathlessly exciting, likely meaning the episode will forever be remembered as one of the reboot’s ultimate Master-pieces (I’ll see myself out). 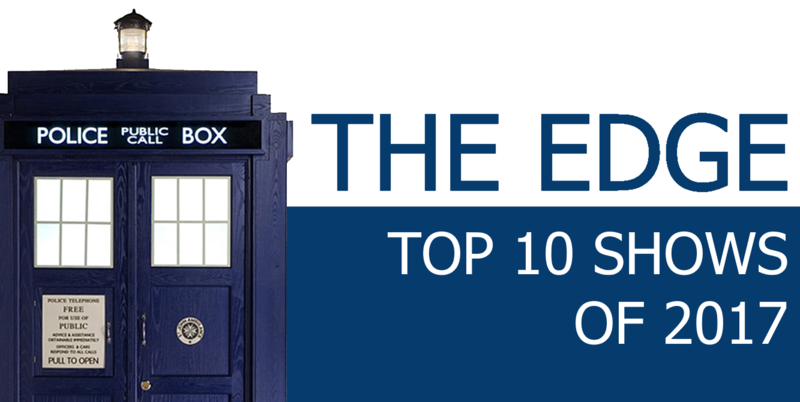 Overall, Season 10 marked a return to form for the iconic sci-fi series and flourished with its tight scripts, impressive performances and fresh-faces. It served as a fitting swansong for the Steven Moffat, the show’s infamous showrunner who has now handed the controls over to the Broadchurch kingpin Chris Chibnall. Winter has finally come to Westeros, but it isn’t merriment and festive joy that it’s brought in its wake. The penultimate season of Game of Thrones was perhaps the most anticipated piece of TV in 2017. After 7 years, the HBO series has finally started to ramp up, but the story is far from over. While Daenerys (Emilia Clarke) finally steps foot on Westerosi soil, Jon Snow (Kit Harington) must look to the threats in both the North and the South. After the obliteration of her Tyrell rivals, Cersei (Lena Headey) luxuriates in her new status as Queen of the Seven Kingdoms. It was a season that promised great things and delivered so much more. From thrilling battles beyond The Wall to shocking twists and revelations, Game of Thrones outdid itself once more in 2017. As shooting for the final season begins I have only one request to make of the producers: DON’T F*** IT UP! Aw Jeez! R-R-R-Rick and Morty comes in at second place with its totally schwifty third season. Although Season 1 and 2 didn’t even air in the U.K when they first debuted, the adventures of madcap scientist Rick Sanchez (Justin Roiland) exploded in popularity this side of the Atlantic in 2017. That’s not to say that the Adult Swim series didn’t have its fans over here beforehand, but its arrival on Netflix certainly helped it reach a wider audience. Simultaneously generating infectious catchphrases and crafting surprisingly deep characters, it’s not surprising that Rick and Morty is the most beloved animated series since The Simpsons. Season 3 saw Rick escape from the Galactic Federation, turn into the now infamous Pickle Rick and drunkenly destroy a group of superheroes called the Vindicators. However, we also got episodes focusing on other characters, most notably the ‘The Ricklantis Mixup’ and ‘The ABC’s of Beth’. While we have no idea when we’ll be returning to Dimension C-137, it can’t come soon enough! Okay, we are one predictable bunch. After coming out on top of The Edge‘s TV Show of the Year in 2016, getting incredibly positive reviews throughout its second run and featuring on the cover of our second print issue, it’s not particularly surprising that we’ve voted Stranger Things as our favourite piece of television from 2017. Nevertheless, it deserves it. If we thought the debut season was a tough act to follow, Season 2 was a thrilling ride from beginning to end (with the debatable exception of Episode 7). We’ve got a shockingly Game of Thrones-y death, two incredibly thrilling final episodes, peak Steve Harrington and some killer tunes. Season 2 did what Stranger Things does best: paying tribute to the ’80s while remaining fresh with its brilliantly-paced plot. However, the Duffer Brothers knew the show needed more than witty tributes and kids running around to be as punchy as Season 1, so character development is a focus. We see scars and trauma, deeper exploration of relationships and most of all, kids forced to grow up before they should. Season 2 of Stranger Things is the best TV of the year, and if the Duffers keep finding new places to go, we might see you right here next year for Season 3.